I’ve settled in to my new office. At the beginning of January, I moved my office from a 1972 building in Cherry Creek to a 1920 building in Capitol Hill. Although there’s so much to love about my new office, the gentle hot-water heating and the natural light are at the top of my list. The loud 1970’s HVAC and fluorescent lights in the old office were wearing on me. I’m now in the Historic Kistler-Rodriguez House. Here’s an old photo, which I copied from the nomination form for the building’s historic designation. Denver’s Capitol Hill has a number of large old mansions that are currently used as office buildings. There’s an interesting reason for this. Denver’s 1957 zoning code drastically “up-zoned” Capitol Hill, which at that time was covered with single-family houses, to residential high-rise zoning. Capitol Hill’s proximity to downtown Denver makes its land valuable, so demolishing houses to make way for high-rises started to make a lot of economic sense. 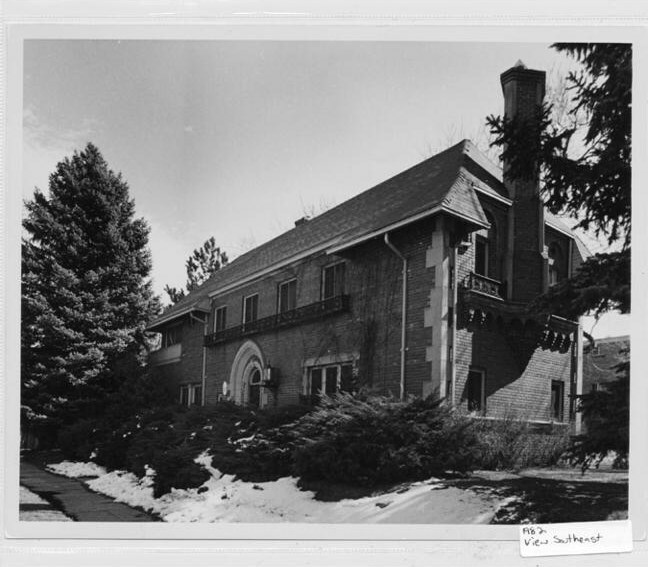 But Denver’s citizens didn’t want all of its historic mansions destroyed, so an interesting exception was carved out in the zoning code to allow for designated Historic buildings in residential-zoned districts to be used for office use. The highest and best use for these properties was suddenly less clear. Demolition to make way for more dense income-producing residential buildings was no longer necessary; with a few alterations, these buildings could generate more income per-square-foot as office buildings than they could as residential buildings. This exception saved many historic buildings from destruction by allowing them to produce more income for their owners than residential use could, which de-incentivized their demolition. Shortly after the photo above was taken in 1982, a “glass box” addition was added to the south side of the building. It’s a pretty cool addition, and, to use a word favored among architects, a nice juxtaposition of 1920’s and 1980’s. The Kistler-Rodriguez House, also known as the Dominican Republic Consulate, was designed by Jules J.B. Benedict, and was built in 1920. It was designated (entered into the National Register of Historic Places) in 1983. I’ve often called the building the “Governor’s Park Dental” building, because my dentist has been the main tenant of the building for the last 30 years. The Denver Public Library has more information on the building here, and here’s a link to the National Register Nomination Form that was submitted to the Department of the Interior. Working on historic preservation in Denver is still important today. Among other things, Capitol Hill United Neighborhoods (CHUN) Historic Preservation Committee works on getting historic buildings designated as Historic. To get involved, start by learning more, here. There’s a Frank Lloyd Wright-designed house in Phoenix that’s at risk of being demolished in a couple of months. Here’s the New York Times article about it. After Mike Brady, Frank Lloyd Wright is the most famous American architect ever,1 so how is this happening? How is it possible that cool buildings designed by famous architects can get knocked down? The answer is that sometimes the people who want to save them just get there too late. But this post isn’t about “The Brady Bunch,” Frank Lloyd Wright, or mid-century modern homes. It’s about Denver and its heritage. Right here in Denver, buildings by less famous architects, buildings that are integral parts of their neighborhoods, buildings that are important parts of the city’s history, are at risk. Once in a while, a century-old masonry building, that, with careful maintenance, would still be around for another 100 years, gets razed to make way for new construction. Most of the new construction in Denver is unlikely to last as long as 50 years. This type of replacement is not sustainable, this is not green, this is not good for Denver’s urban fabric and its urban dwellers. People need to become aware of these buildings early, before they become at risk of destruction. Sure, there are property rights issues that arise sometimes, but if we start talking about rights, we cannot ignore the property rights of the surrounding property owners, and the rights of the citizens to these parts of their heritage. Two really special buildings that I’ve been in recently, the Croke-Patterson-Campbell Mansion and the Wilbur S. Raymond House, have been preserved and restored, and are currently the homes to a couple of bed and breakfasts. 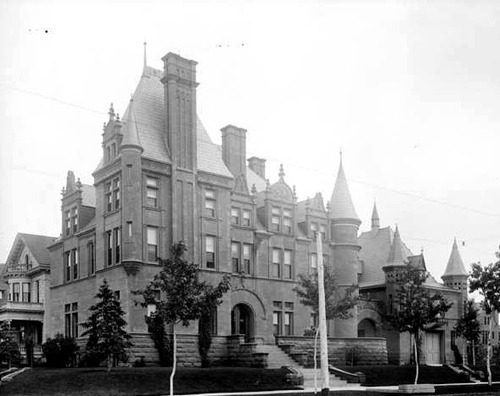 Here’s a great old photo of Denver’s Croke-Patterson-Campbell Mansion, taken in 1892. It looks almost too fantastic to be real. The building has since lost some of that magnificent chimney, and many of the finials, but it’s still breathtakingly beautiful – here’s a recent photo (scroll down after the page opens). The Croke-Patterson-Campbell Mansion has just started to operate as a bed and breakfast, the Patterson Inn. Sadly, much of the original neighborhood fabric around the Croke-Patterson-Campbell Mansion has been lost. But the Wilbur S. Raymond House is very much a part of a historic Denver neighborhood, the Wyman Historic District. Here’s an old photo of the Raymond House. It’s been the Castle Marne Bed and Breakfast since 1989. This is my favorite image of the more recent images I’ve found online. Here’s a good image showing its famous roses. The neighborhood fabric and the Wilbur S. Raymond House enhance and enrich each other. Cities aren’t made up of scattered signature buildings, and historic preservation shouldn’t be approached in that manner, either. Cities are composed of neighborhoods, which are composed of buildings of varying significance. We need to protect special buildings, but we need to go a step further and also protect the individual historic buildings that may not be as prominent, but without which, historic neighborhoods would not be complete. Obviously, important buildings are at risk (such as that Frank Lloyd Wright house in Phoenix). But neighborhood fabric buildings may be even more at risk. Historic buildings are irreplaceable, whether they’re outstanding, or more “background” buildings. As an architect and architectural specifications writer, and the owner of an old house, I’m intimately familiar with the differences between the construction practices of today and the construction practices of a century ago. Buildings are not built the way they used to be. In other words, “they don’t make ‘em like that anymore.” (“They” could, but “they” don’t.) Old masonry buildings are more durable, they can take much more neglect and mistreatment, than new buildings (even new buildings with brick on the outside). It’s because of building science – a topic for another post. Architects, engineers, and constructors cannot make up for occupant behavior in most new construction, but old buildings, with plaster finishes, hardwood floors, and multi-wythe loadbearing masonry exterior walls, can take some abuse and neglect from occupants, and will continue to be able to withstand use. Old buildings can often be adapted to new uses, whereas buildings built in the last 50 years are usually difficult to use for purposes other than their original uses. Multi-wythe masonry walls and plaster finishes are more forgiving of moisture intrusion than buildings built with newer methods of brick veneer on exterior framing, and gypsum board finishes. People used to build with multi-wythe masonry and plaster because they didn’t have other good options. Today, we have less-expensive (and less-durable) options, which have made multi-wythe masonry and plaster much more expensive options. If you want a durable building, in the long run, it’s probably a better value to use what you already have… and preserve an old building. I have to thank Jules Dingle for the Mike Brady comment. Sophomore year in college, Jules said that Mike Brady is the most famous American architect. Obviously, that comment still cracks me up today. We’re doing some maintenance work on our home, a 1904 brick foursquare in Denver (a “Denver Square”). Someone painted the brick years before we bought it, and it’s time for fresh paint. Preparation of the brick for repainting revealed that we needed much more repointing (tuckpointing) of the mortar joints than I had anticipated. So… what does that mean? Old brick buildings are really interesting. The brick is often pretty “soft,” and the mortar is even “softer.” By soft, I mean that you can gouge it or wear it away pretty easily; it’s, well, kind of weak. Our house has butter joints – really skinny mortar joints – with mortar color that matched the brick color. The house must have been so beautiful before someone came up with the “genius” idea of painting the brick… but I suspect that they painted because they thought they could substitute painting for repointing those mortar joints. Well, now we’re repainting AND repointing, so THAT didn’t work! Whoever made that decision decades ago really wasn’t acting in the best interests of the house. Sometimes, it’s better to do nothing at all than to do the wrong thing to a building. Masonry walls need to be able to let water out, and need to be able to let water VAPOR out, and individual bricks in a wall need to be able to move a bit, in case they expand due to water absorption. Yes, bricks are a bit porous, and water gets into brick walls. You just can’t keep water out, so you always need to provide ways for it to GET out. Unless you want damaged bricks, you need the bricks to be able to move, and you need the brick wall to be able to “breathe,” at the locations of the mortar joints, so you need the mortar to be “softer” than the brick (weaker and more porous). When it’s time to do repairs on an old brick building, you need someone who knows how to do it right. (Mortar-in-a-tube is not the right thing to use on an old building! Old mortar was made with much more lime than today’s mixes have – for old masonry, you really need a specialist.) We hired a mason who specializes in restoration of historic masonry. No, we didn’t need some of the fancy things that masonry restorers are capable of doing, such as matching new mortar color to the existing historic mortar color. (Ours will be painted over). But not everything that we do for buildings is for appearances. Much of what the caretakers (you know, the owners) of old buildings need to be doing is for the long-term FUNCTIONING and durability of the buildings. Building elements that function well, and are durable for the long-term, contribute greatly to the beauty of buildings. Durability should be a primary focus of the sustainable (green) building movement. Build buildings well in the first place, maintain them properly over the years, and keep all that embodied energy in our cities instead of sending it off to landfills. Some well-meaning people are trying to ram an ethic of sustainability into a throw-away society, and it’s just not gonna work unless we develop, train, and properly compensate, our skilled building tradespeople, and develop in homeowners a strong sense of needing to care for their buildings, instead of just selling and leaving when maintenance needs present themselves. I got off an important tangent up there. Back to that paint – the new paint is a necessary evil for my house, since someone already painted the brick years ago. Paint that is firmly attached to old brick should not be removed – removing the paint almost always removes the toughest part of the brick – the part that got fired. The inside of the brick is a bit softer than the exterior fired surface, so once a historic brick building has been painted, it should remain painted. Removing the paint could cause the brick to slowly erode away. However – you want paint that will not keep water in that wall. You want paint that can “breathe.” Flat paint typically is more vapor permeable than glossy paint, and latex paint is more vapor permeable than alkyd or oil-based paint, so if you have to paint brick, use flat latex paint. I wanted flat paint for aesthetic reasons, so I was thrilled to find out from Diane Travis at the Rocky Mountain Masonry Institute that I was on the right track functionally with flat paint because of its higher vapor permeability. Diane emailed me this great brochure on “Maintenance and Repair of Older Masonry Buildings” when I contacted her for masonry contractor recommendations. The brochure is a good resource, and so is the Rocky Mountain Masonry Institute! You can download a copy of the brochure if you click here. Regarding those skilled tradespeople – I got two recommendations for masonry contractors who specialize in historic masonry repair and restoration. Both contractors were highly recommended, and were recommended by more than one person. Both do commercial and residential work. I met with Gary Holt of Olde English Masonry and John Voelker of Cornerstone Restoration, and we hired Cornerstone because of schedule availability. Cornerstone did great work. If you need a masonry specialist, either contractor would be great. They’re both busy, so plan ahead. Your old brick building deserves to be maintained by an expert. While you’re the caretaker of an old brick building, do the right thing for your brick. Sagebrush Capital, a developer who is under contract with the Archdiocese of Denver to buy the property, intends to demolish all the buildings and build an apartment complex on the site. Sagebrush’s application for a certificate of non-historic designation from the city (a precursor to an application for a demolition permit) prompted city planners to open up a time period to allow people to apply for the building to be designated as a Landmark Structure. A representative of Sagebrush Capital says that “it’s not materially, structurally or economically feasible to redevelop these buildings.” It’s often not economically feasible for for-profit companies to redevelop historic structures. However, the question of material and structural feasibility should be answered by a different party. “It is hereby declared as a matter of public policy that the protection, enhancement, perpetuation and use of structures and districts of historical, architectural or geographic significance, located within the city or its mountain parks, is a public necessity, and is required in the interest of the prosperity, civic pride and general welfare of the people.” – Denver, Colorado, Code of Ordinances, Title II – Revised Municipal Code, Chapter 30 – Landmark Preservation, Article I. – In General, Paragraph 1. Some of these buildings at the Cathedral High School complex are irreplaceable. Buildings such as these contribute to the character of our city in a way that cannot be duplicated with new construction. Historic buildings often act as a cornerstone for neighborhoods, and are a source of local pride for good reason – they’re unique and memorable. What makes Denver the city it is? What happens when that historic character is “all used up”? At that point, why would anyone want to live in (or build in) Denver, if similar nondescript opportunities for living (or building) are more economically feasible elsewhere? I will be extremely disappointed if Landmark Preservation Commission does not recommend to City Council that the exemplary buildings be designated as Landmark Structures. I will be extremely disappointed if City Council does not vote to designate the exemplary buildings as Landmark Structures. The long-term benefits of preserving the special things about Denver, including historic buildings that contribute to the character of our neighborhoods, need to be a higher priority than any short-term economic benefit. I believe that there should be a clear separation between an original historic building and an addition to that historic building. I happen to strongly prefer traditional additions onto historic buildings, but I consider my style preference to be personal, and not something that should be dictated by historic preservation guidelines or zoning codes. I want to see the historic building as its own entity expanded by what is obviously a later addition. I do not want to see a historic building with an addition with brick toothed in and a new seamless roof over the entire building. This misleads future observers of historic buildings into believing that the building was originally built that way. It waters down future observers’ understanding of the integrity of historic forms and construction methods.